Note added 5/22: Here is an excellent description in CNN news of tornado formation from a NOAA weather researcher, and here is an excellent technical discussion by Cliff Mass (on his May 21 post). Update: A one-mile wide tornado, estimated already to be an EF-4 or EF-5, moved through Moore, Oklahoma, south of metropolitan Oklahoma City, destroying houses over a significant area along a two-mile wide track. Reports are that two elementary schools, Plaza Towers and Briarwood, were hit, and that the number of children taking shelter in those schools and currently unaccounted for is up to 75. Moore Medical Center had to be evacuated, with patients being evacuated to Normal Regional Hospital and Health Plex Hospital. There is a video of the tornado on this CNN website (at least until they replace it with something else). Moore was devastated on May 3, 1999 when 36 people died and over 8,000 homes were badly damaged or destroyed. The hook echo trace from that tornado is discussed at the end of this post. 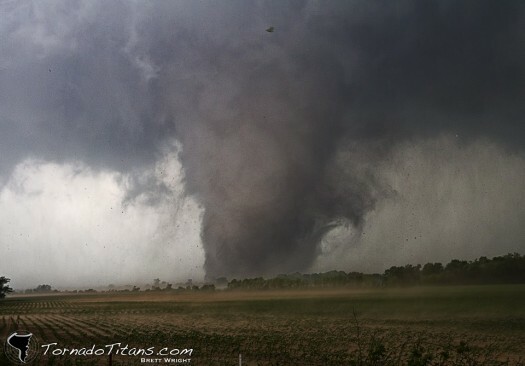 There is an incredible time-lapse photo of this tornado here, as long as it keeps being posted. It's absolutely frightening. It shows the strong rotation that occurs in these storms, discussed below. My heartfelt sympathy and prayers to the people affected by this storm. NOTE: Between the time I started this and posted it, the forecast for storms in my area of central Illinois has gone from "strong severe storms predicted for 5:00" to "isolated thunderstorms." Forecasts from the commercial sites, such as weather.com or wunderground.com vary considerably. Here's the National Weather Service site--you can type in your own state and county or city. I love meteorology and weather forecasts, but sometimes I find the jargon baffling. 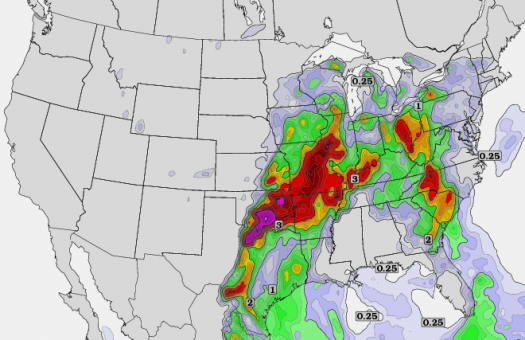 During tornado season (springtime, April-June in Illinois), we hear the words supercell, mesocyclone, updraft, instability, wind shear, dry line, hook echo, tornado warning, tornado watch, jet stream trough... Here I'll try to put these all into context in a "primer" on tornados. The first ingredient needed for tornado formation is a storm, but not just any old storm. The storm has to be a so-called "supercell thunderstorm." A supercell is an organized thunderstorm that contains a very strong, rotating updraft--called a mesocyclone. Supercells usually exist apart from other storms because they grab up energy and moisture from miles around, hogging it to themselves, so to speak. Because of hoarding, supercells can dominate the local weather up to 20 miles away (but can also be buried within a squall line). Next, another essential ingredient for supercell and tornado formation: wind shear. This simply means that there needs to be winds of differing strength between the ground and the upper atmosphere. In the figure with the red arrows here (from Wiki), imagine that the wind velocity is about zero on the ground, and "strong" at higher elevations. If you hold your palms together and move one relative to the other, you are "shearing" your hans. 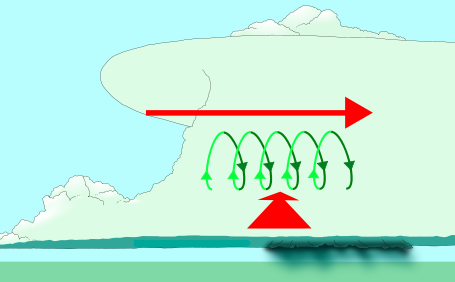 Wind shear sets the air near the ground spinning around a horizontal axis (the figure with the red arrows). As such air starts to rise ("convect," like in a convection oven) in a thunderstorm, the spinning air is drawn upward, that is, the spin axis changes from horizontal toward vertical (the other figure). If conditions aren't right to produce these rotating updrafts, no tornado danger! So, a mesocyclone forms within a thunderstorm when air rises and rotates about a vertical axis. They are typically 2-50 miles in diameter, but can be bigger or smaller. The typical meteorologic setup for severe weather. Tornados form where three different types of air come together, illustrated to the left. First, there must be warm and humid air near the ground. Typically this hot humid air is driven by winds originating in the Gulf of Mexico (the green area). Second, there must be cool, dry air being blown by westerlies from the northwestern states and the Rocky Mountains (the blue area). These two air masses are separated by an imaginary line that separates the warm moist air from the cool dry air, the "dry line." It occurs roughly where the 55 F line lies north-south across the continent (in the illustration to the left, it is the unlabeled dashed line in Texas and Oklahoma). In this illustration, tornados form along the dry line. In the illustration above, warm dry air is flowing from the south into Texas, Oklahoma and Arkansas. If the temperature is the same everywhere, as it tends to be on the east side of the dry line, the moist air is denser than the dry air, and so it will "wedge under" the dry air. The dry air forms a "cap" that allows the warm air near the ground to get even warmer. As I write this (1:30 in the afternoon, with the severe storms originally predicted to hit in a few hours, the humidity is increasing noticeably, but it is not yet intolerable. The temperature is 88 F, the relative humidity is 35%, and the dew point is 57 F. If that dew point gets up to about 70, trouble almost inevitably looms. The apparently low dew point now is probably one reason that the forecasted severe weather this afternoon is no longer in the predictions.) As the temperature increases in the warm moist air, the density decreases until it is less than that of the cap, and it wants to rise. That is, the situation becomes unstable. Next, something must change to allow the warm, humid air near the ground to punch through the hot dry cap. Note in the figure above that the jet stream (blue) forms a "trough" of cold air coming down from Canada, whereas the red line with dots, a so-called "warm front" separating the warm and cold air exists over Missouri and Kansas. The jet stream is always acting to push weather systems from west to east across the U.S. colliding at this time of year with the warm front. At this collision, a severe weather pattern can develop. Air aloft moving from west to east begins lifting the cap and warm air, allowing upward movement (updrafts) and, sometimes, explosive thunderstorms to develop as the warm air rushes upward. Within a supercell, "hook echos" on radar are an indication of a tornado-producing supercell. The first hook echo documentation occurred on April 9, 1953 by the Illinois State Water Survey, now a part of the University of Illinois, my home! A tornado watch may be issued when conditions are right for a possible tornado, but a tornado warning usually implies that a tornado has been sited. 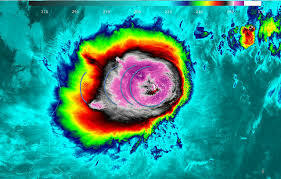 The existence of a hook echo on radar is sufficient to prompt the National Weather Service to issue a tornado warning, even if a tornado has not been sighted on the ground. So, for those residents of Texas, Oklahoma, Arkansas, Kansas, and Missouri still under the gun today, best wishes for your safety. a March 17, 2013 image. NASA image. 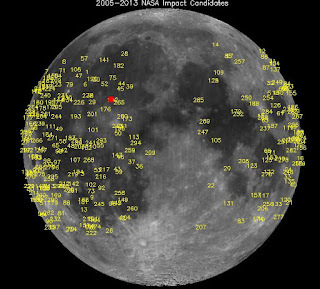 NASA and University of Western Ontario scientists have discovered the largest impact observed to date on the Moon in an 8-year old monitoring program aimed at identifying streams of space debris that pose a potential threat to the Earth-Moon system. They estimate that the crater formed could be up to 20 meters in diameter. The impact generated a cloud of gas and pool of hot melted rock that gave off a flash detected on a monitoring video. NASA scientists estimated the impact velocity as 25 km/s (the number that appears in the press is 56,000 mph), and that the impactor was 0.3-0.4 meters in diameter weighing about 40 kg. They haven't given the basis for these numbers. 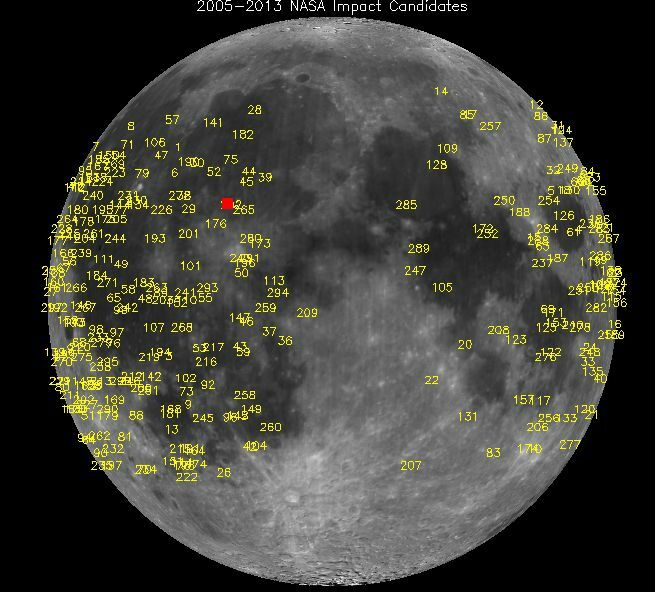 My "guess" is that they assumed that the diameter of the crater was related to, or equal to, the diameter of the luminous spot and that they back-calculated an impact energy for this. Then, assuming a most probable impact velocity of 25 km/s, the could back out a mass for the object. My thesis advisor, the late Gene Shoemaker, would be having fits about this whole discussion because he drilled into us students that meteorite impacts are not at all like chemical or nuclear explosions. 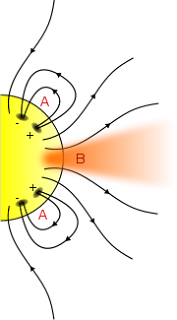 Rather, they involve a process in which shock waves generate by the impact propagate both downward into the target material and backward into the impactor. The shock in the target material travels down into the ground and outward away from the impact site. Meanwhile, the shock in the meteorite is reflected off of its back surface as a rarefaction, or expansion, wave. The expansion wave eventually overtakes the shock wave propagating down into the ground. Before it does, however, the meteorite has pretty much been vaporized and melted, as has a portion of the ground under and around the impact site. This material, generating the bright flash seen on the records, is ejected from the crater, some probably escaping into space, some returning to the surface around the newly-formed crater. Less highly shocked rock is also ejected from the crater onto the lunar surface, forming an ejecta blanket and perhaps some rays. NASA has passed on word to the controllers of the Lunar Reconnaissance Orbiter who may be able to image the crater the next time the spacecraft passes over the impact site. This would provide a valuable test of the assumptions that went into interpreting the flash in terms of the impact dynamics and the crater properties. is from the CNN blog site found here. Unless you want a dose of salt and probably copper and zinc as well, you wouldn't want to drink this stuff. And, instead of the nice fizz of carbon dioxide used in soda pop on earth, this gas is a nasty mixture of methane, hydrogen, nitrogen and helium. Probably stinks. While the CNN blog (referred to in the figure caption) plays up the implications for ancient life (none has yet been found in this water) and hence ancient life on Mars hidden in deep old pockets of water, the Nature article** is of interest for other reasons. The abstract points out that old fluids are generally studied in very small amounts--as fluids, called "fluid inclusions," trapped in crystals at the time of growth of the crystal. Until this paper, ancient fluids have not been found outside of these inclusions, for example on the surfaces of minerals at their interfaces, or in fractures in the rock. As the crust deforms throughout geologic time, these fluids move around and come to be preserved in pockets. In one system 2.8 km below the surface in a gold mine in South Africa, fluids that are several tens of millions of years old contain "extant chemoautotrophic microbes". What does that mouthful mean? "Extant" means "still surviving," and "chemoautotrophic" means that these organisms obtain their energy from chemical reactions such as hydrogen sulfide, sulfur, ferrous iron, molecular hydrogen, and ammonia, and that they use CO2 for the carbon to make organic molecules. Bacteria and archaea that live in hostile environments such as deep sea vents are often chemoautotropes. The authors of the article sampled fluids 2.4 km below the surface in crystalline rocks that are about 2.7 billion years in age. The Timmins mine is in a massive sulphide deposit producing copper and zinc ores. 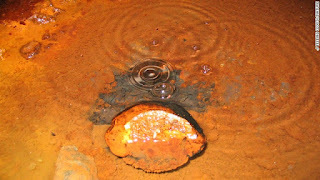 The fluids sampled discharge from exploration boreholes that have flow rates of 0.1 to over 2 liters per minute. Xenon and radiogenic noble-gases in these fluids provide evidence that these fluids have been isolated for at least a billion years, and possibly as long as 2.64 billion years. While they have not (yet, at least) found evidence for life in these fluids, the paper stresses that the fluids are of a composition capable of supporting life, and that the fact that they can be isolated in the earth's crust for these long times "may require changes in our understanding of the extent of the Earth's crust that may be habitable." By analogy, the authors speculate that similar fluids could be in the tectonically quiet geologic terrains on Mars for similar periods of time. **Holland, G., and others, "Deep fracture fluids isolated in the crust since the Precambrian era," Nature, 497, 16 May 2013, page 357. Bearing in mind that hurricane, cyclone and typhoon are all words for big cyclonic storms, Cyclone Mahasen bearing down on Bangladesh, Myanmar (formely Burma) and possibly northeast India depending on its trajectory. The low-lying areas poses a flooding threat to millions of people, some estimates being as many as 8.2 million. Particularly at risk are about 140,000 living in makeshift quarters in low-lying camps. The cyclone has weakened to a Category 1 tropical storm rather than a cyclone, but the large extent of low-lying areas in Bangladesh poses a major problem with wind, rain (up to 500 mm), tidal surge and waves in the forecast. Mahasen is being pushed to the northeast by a trough of low pressure. There are heavy thunderstorms, largely out over water around the southeastern coast of India. MODIS images on NASA's Terra satellite showed that (as of May 14) it was a tightly wound, compact storm with strong convection around the storm center. it is moving about 8 mph to the northeast (as of May 14). Sea surface temperatures in the Bay of Bengal are near 84-86 F, warm enough to support the tropical cyclone, and vertical wind shear is minimal, allowing the storm to potentially strengthen. NASA has released an image (lower right) on which someone has sketched atmosppheric gravity waves traveling out from the center of the storm. This suggests that the core of Mahasen extends up into the stratosphere. Gravity waves transfer the momentum from the stratosphere back down into the troposphere as the system seeks to regain density equilibrium. 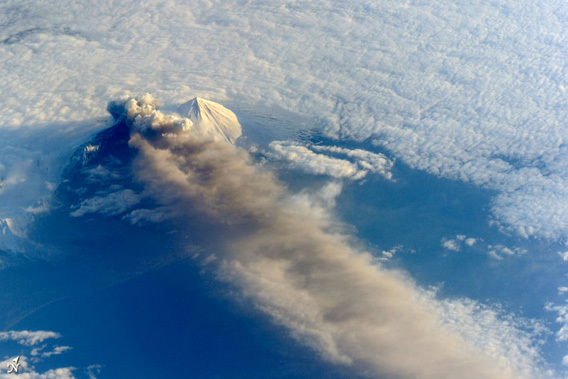 This storm illustrates a potentially tragic intersection of earth processes and human affairs. A stateless Muslim minority, the Rohingya, was created when sectrian violence erupted between Buddhists and Muslims last year. The Rohingya suffered during decades of military rule in Myanmar, and they have been forced to live in camps in the low lying areas of these countries. The Rohingya are reluctant to leave the camps because they distrust the security forces involved, say United Nations spokesmen. Already a boat ferrying people from one camp in Rakhine (a state in Myanmar) to safer areas has capsized with 58 people still missing from the accident. Authorities are well organized for the storm preparation, having been subjected to repeated cyclones. In 1970 Cyclone Bhola killed an estimated 400,000 people. Landfall is expected Thursday or Friday morning near Chittagong, Bangladesh, which may spare the restive state of Rakhine from its full impact. Let me preface this with a disclaimer: I took a graduate level course in "Electricity and Magnetism" from one of the most fearsome texts ever inflicted on a student, the infamous "Jackson's E and M." It's still used to this day, and everyone that I've met has agreed with me on the difficulty. ***See footnote! I not only took it once (in the physics department at the University of Colorado) but again (in the physics department at Caltech) where I didn't understand it any better than the first time around. I blame at least part of my difficulties on faculty who didn't tell me that a course in complex variables was a prerequisite--I'd never had it, and my knowledge of complex variables was limited to the square root of -1!..... Ah, it feels good to make that confession after a mere 45+ years! Hopefully this deficiency won't show up in this post! Imagine being a telegraph operator and getting shocked by your equipment, or getting up because it was light out only to find out that it was still the middle of the night, or seeing aurorae in the Caribbean! These are some of the effects of the so-called "Carrington Event," a powerful geomagnetic storm in the earth's magnetosphere caused by a massive solar flare and a coronal mass ejection (CME). This was the largest on record, but there have been others. The scientist, Richard Carrington connected the earth's disturbance to the solar flares and is considered the father of "space weather." A huge solar flare in 1989 shut down Hydro-Quebec, the power grid servicing all of Quebec (and if you've been in Quebec in the winter you can imagine the consequences of such a shutdown). The storm caused tripped five lines from the James Bay facility, causing a loss of over 9,000 MW during a time when the integrated power system (that included Chrchill Falls and Mania-Outardes) was demanding 21,000 MW. The system couldn't withstand that loss and collapsed within seconds. It took 9 hours to restore service and even then 17% of Quebec customers were without electricity. Restoration occurred on a Monday morning when there is typically a high demand on the system, exacerbated by a high demand in heating after 9 hours without power. Another storm in August 1989 caused a halt to trading on Toronto's stock market. Fears today are that similar storms could cause severe damage to modern "smart power grids," perhaps knocking out power for months over areas of hundreds to thousands of miles wide. Financial services, clean water supplies, and even medical care could be crippled by such an event. In addition to disturbances in the earth's magnetic field, some effects of space weather are high radiation levels, auroras, power outages, radio blackouts, satellite damage and space radiation hazard to astronaut health. In the April 30 Eos, Transactions of the American Geophysical Union, Madhuilika Guhathakurta at NASA headquarters updates NASA space weather research. NASA needs to know the "weather" everywhere in the solar system because there are satellites currently out to the far outer reaches, and it's only a matter of time before astronauts are there as well. Only a year ago, an intense event occurred, covered on my March 7, 2012 post (Apologies to the reader, but for some reason Blogger is not doing links properly these days). Earlier ones that I have posted including the "Newt Gingrich headliner" of November 14, 2010 that got a lot of hits when I posted it! There is a nice movie on that post. Also, see January 21, 2012, for January 23, 2012, and March 7, 2012. The last one lasted two weeks during which an "angry-looking active region rotated across the solar disk and fired off more than 50 flares, 3 of which were X-class flares, the most powerful type of flare." Before it died, it had hit every spacecraft and planet in the solar system at least once with either a CME or a burst of radiation. The Eos article reports a private communication that this massive activity caused reboots and data outages on as many as 15 NASA spacecraft. The Eos article is entitled "Interplanetary Space Weather: A New Paradigm." 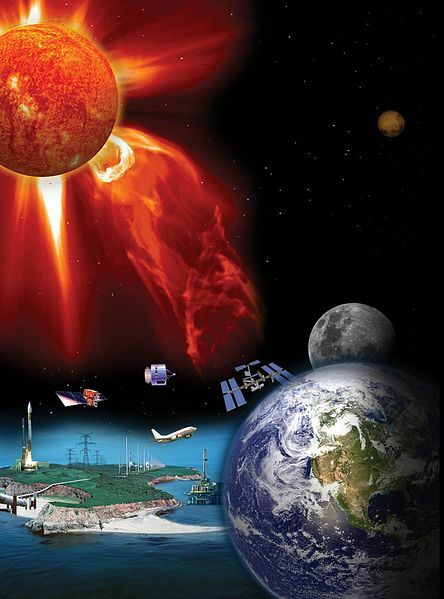 The "new paradigm" is that in contrast to the 'older days' when the focus was on forecasting space weather in the vicinity of the earth, it can now be forecast throughout the solar system, and it was this capability that allowed some protection for spacecraft during the 2012 outburst. NASA has a "heliophysics" fleet of spacecraft, and now has been joined by the Japanese Aerospace Elploration Agency, the European Space Agency and NOAA. Using techniques akin to those used for hurricane forecasting tracks, massive supercomputers at NASA Goddard combine satellite and ground-based data to predict when storms will hit the planets and the NASA spacecraft. E-mails are sent to alert mission scientists when a bout of space weather is about to hit them. This image is from the Wiki article here. the lines far out into space. The existence of crustal sources of magnetism on Mars means that the magnetic fields are very complicated. Brain describes thee different topologies that the field lines can take on: ones with both "ends" in the interplanetary magnetic field (IMF), closed field lines connected at both ends to Mars (the so-called crustal field lines), unconnected field lines connected at both ends to the IMF, and ones that are open and connect Mars to the IMF. Changes in topology amongst these lines by reconnecting or merging allow the solar wind plasma to be trapped in so-called "magnetic field umbrellas". This leads to a possible answer to a long-standing question: Why doesn't Mars have an atmosphere? We know that Mars once had an atmosphere thick enough to allow liquid water to exist on the surface, yet now it's atmosphere is only a few millibars, a few thousandths of that of the earth. Is it possible that magnetic umbrellas were involved? Could solar wind buffeting the umbrellas cause the magnetic field to pinch off parcels of air trapped in the umbrellas and propel air-filled magnetic bubbles into space? In 1992 Janet Luhmann and colleagues noted, from Pioneer Venus observations that the atmosphere of Venus was being stripped by the solar wind. They predicted that a substantial loss would have occurred in Martian history. Bruce Jakosky used the ratio of 38Ar/36Ar in the atmosphere and in martian meteorites, and noted that it was some 30% greater than that of the Earth and loss to space was the only process that could produce this type of enrichment in a noble gas. These studies, along with those of other isotopes, suggest that 50-50% of the atmosphere has been lost over time. These studies, amongst others, lead to NASA's MAVEN mission to Mars, set to launch in about 6 months. One goal of MAVEN is to relate the upper atmosphere/solar-wind interactions to the climate and atmospheric history to unravel the history of the surface and past or present habitability by microbes. Wow...sure makes me wish that I'd done better in that E and M course! *Brain, D.A., Mars Global Surveyor Measurements of the Martian Solar Wind Interaction, Space Science Reviews, 126, 77-112, 2006. ***See the hilarious comments about this book here (second edition, the red book) and here (third edition, the blue book)! We true veterans have the green book, 1st edition! I appreciate the help in defining "stealth disaster" and have received your comments. For some reason, Blogger is not allowing me to edit the corrections/additions in to the table, and I am on travel. I'll solve this problem when I return in a week. Thanks for your interest and help. World's oldest experiment is a geological fluid dynamics experiment! 2.5 years after the seventh drop fell! eensland in Australia, has never actually seen the pitch drop. He explains that he checks it about 5-6 times a day, but does "need some sleep"! In 1979, he missed the drop after skipping his usual Sunday campus visit, and in 1988 he missed it by 5 minutes after stepping out "to get a refreshment." The last drop, in 2000, was supposed to be captured on a film setup, but the equipment failed. The drop takes less than a tenth of a second, so even if he was present, if he blinked, he would have missed it. Tar is distilled from wood, coal, or peat. It consists of hydrocarbons, resins, and alcohols. Because it acts like a solid, it was used in early days to preserve wooden ships against rot, the largest user being the Royal Navy. Tar may be best known to many people for the La Brea Tar Pits in Los Angeles. Many animals got trapped in the tar pits, died, and left behind their skeletons. I've not seen the tar pits in a very long time, but my memory is that they are a mixture of thick viscous tar and solid mounds. Tars have been described as Bingham plastics between 85-180 C, having a defined yield stress and plastic viscosity. Anyone who has the misfortune (like me, twice) to drive on a road that is undergoing resurfacing or repair knows what happens when tar cools below this temperature. In the case of my car (just yesterday), the hot liquid material splashed up, cooled and solidified on the sides and back of my car. (Fortunately, there are products on the market to remove tar from vehicles, but they don't tell you that it also requires a lot of elbow grease!). So, Professor Mainstone has shown that if you give even cold tar enough time (more than 80 years), tar isn't really a "solid" at all. Hmmmm....I wonder if I wait that long if it would fall off my car, or just drop down another inch or two!